Jackets in 1st picture: Boutique To You (similar here & here). Leggings: Geode Designs. Shoes in 1st picture: Steve Madden (old). Sometimes, you just gotta put on your fun pants. And these leggings by Geode Designs take the cake for the coolest pants we've ever seen! Dress them up or down, add an unexpected pattern or texture, anything you wish. We decided to pair them with high heels and jackets, to put our girlie spin on the look. The hot pink blazer Sakura wears adds a pop of color to compliment the leggings. Ali is wearing a camo jacket with her Geode Designs leggings, to show one of our favorite Spring 2013 trends-- mixing patterns. However you style them, these leggings are asking for a good time. We discovered Geode designs through a friend in the Greek community. What makes their product extra special, is that artists can submit their own designs-- for a chance to be a featured artist in one of their collections. Art & legs, what a genius pairing! 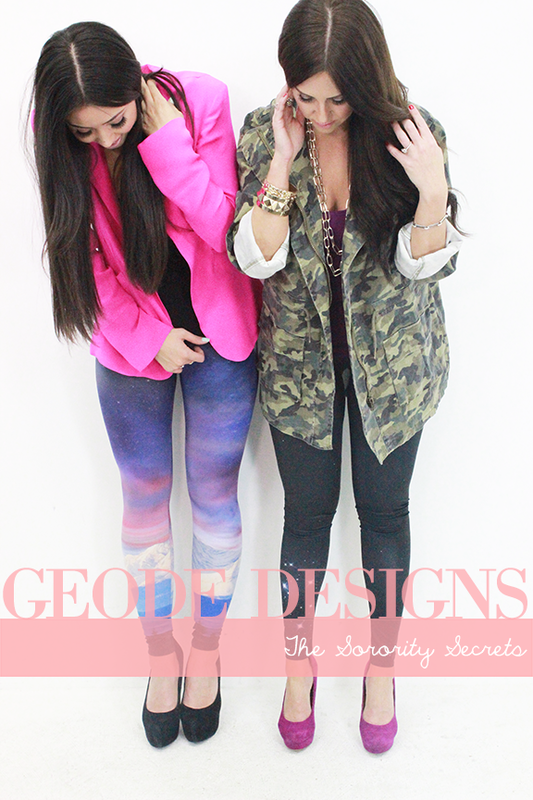 So you want to know how you can get your own Geode Designs Leggings? Step 3: Leave your email below so we can contact you if you have won the giveaway! These leggings are so cool! Great find. Congrats on the site, it looks awesome! OMG SO AWESOME!! I LOVE these!!! These leggings are so hot! I love seeing my sisters hard at work! Congrats girls on the new website!